Welcome to our house personally run by the Barbana family since 1970. A meeting point for both summer and winter season in the traditional “stube tirolese” (typical Tyrolean wooden lounge) to spend some time with friends and enjoy a relaxing evening and “dolce far niente” after a day of skiing and hiking to soak into a total rest in the relaxation area. In any season, summer and winter, it will be a great holiday to enjoy to your liking. Our house has 24 rooms. Our cuisine is careful to every detail and especially to people suffering from allergies or intolerances with special care for people affected by celiac disease. The vacation you were expecting! Our Hotel offers the following services: Lift, outdoor parking, garage, garden, daily cleaning service, bar, tennis court, wireless LAN for Internet access, children playground, telephone, satellite TV, wellness center with solarium, sauna, Turkish bath, massages and hydro-massage. 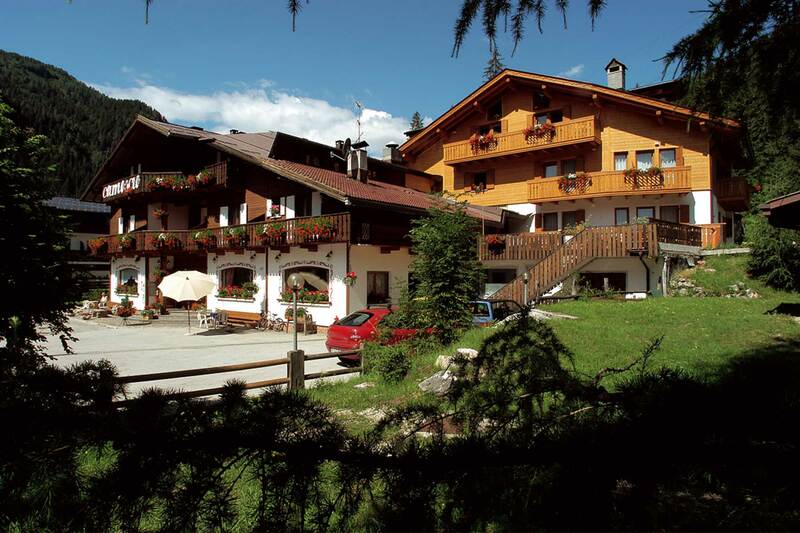 During the winter we also offer: heated ski room with boots warmer, shuttle service to ski runs. We accept payment cards such as VISA, AMERICAN EXPRESS, MASTERCARD, we also accept payment by cash card. Suitable for disabled people and families. Malga Ciapela, touristic place overlooked from Marmolada, the Queen of the Dolomites, it is very valued by every levels’ skiers because of the strategic locatio in and between the most important skiareas with an enormous possibility of choices: the Dolomltes’ Superski. The landscape and the friendly atmosphere make of Malga Ciapela and Rocca Pietore’s area an oasis of the turism. Arabba and Malga Ciapela bring you the sight of wonderful giant mountain formations and the experience of spectacular excursions as well as skiing runs you can only dream about, such as the legendary Sellaronda or a day trip on the 3,342 metre high Marmolada, the ‘queen of the Dolomites’. None of the Dolomite peaks is higher, none makes such an impression. From Malga Ciapela there are cable cars which lead right to the peak. We start off in Arabba, then the tour moves on to Porta Vescovo, which is formed just like a bishop’s cap. 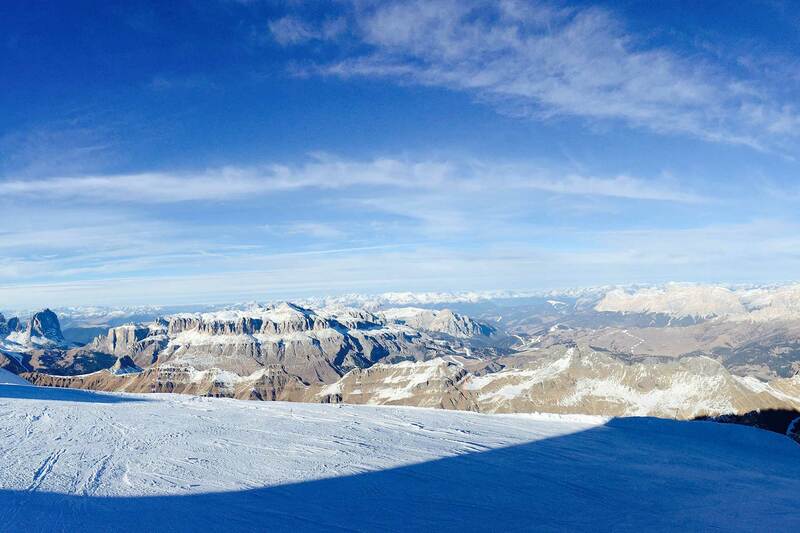 This point offers a breathtaking view of the majestic Marmolada glacier. To warm ourselves up the very fast ‘Ornella’ run leads us towards Pescoi. Over the ridge of the Passo Padon the tour follows on to the Passo Fedaia and from there in three stages to Punta Rocca covering more than 1,300 metres in height, reaching at 3,269 metres the highest point in the whole of the Dolomiti Superski resort area, just a few metres under the Marmolada summit. Tip: the Museum of the Great War (1915-1918) in Marmolada. The Museum of Marmolada, the highest in Europe, is placed at 2.950 mt. in the cable car station of Serauta, on the edge of the glacier. It recalls the mountain front of the First World War (1915-18). The fallen and those who fought are remembered here regardless of nationality or ideological persuasion. They struggled and many died on these icy mountains. War relics, photographs and historical documents are on show. Since the times when the roads where few and just dirt tracks and ski-lifts didn’t exist the journey on skis around the Dolomitic Sella massif over the 4 Passes, used to maintain connections between the inhabitants of those valley, was called “Sella Ronda” in the ancient ladin language. Today it has become a real ski carousel and if you want to try it all you need to do is reach one of the resorts at the foot of the Sella group (Arabba, Malga Ciapela – Marmolada, Corvara, Selva di Val Gardena, Canazei). The Sella Ronda “round trip” can be covered clockwise following the orange arrow signs or else anti clockwise, following the green arrows. The route proceeds under the walls of the most beautiful Dolomites-summits (Marmolada, Sella, Sassongher, Conturines, Fanis, Lagazuoi, Tofane, 5 Torri, Nuvolao-Averau, Pelmo, Civetta). The most experienced tour-leader can show you war-findings, sprint-ditches in the rock, tunnels, bunkers and everything, which Italian and German soldiers built, to defend themselves from the enemy and the bad weather during wartime. The panorama, that one enjoys during the round-trip changes constantly and it will gratify the tourist completely. You will be enchanted by the silence of the nature along the slope of Lagazuoi-Armentarola; the transportation with the horse sledge will make you really enjoyed and at the end you will be shaken from the huge ice walls: the “Great Canyon” of the Serrai of Sottoguda, at the foot of Marmolada. *tip: the Museum of the Great War (1915-1918) in Marmolada, the highest in Europe, is placed at 2.950 mt. in the cable car station of Serauta. On June 26, 2009, UNESCO added the limestone mountains located in northeastern Italy in the list of the most beautiful landscapes in the world. With this act, the United Nations officially recognized, through their organization for education, science and culture, the unique nature of the Dolomites. Today the Dolomites, with their famous peaks of the Marmolada (3,342 m), Tre Cime di Lavaredo (2,999 m), Averau (2,649 m), Sciliar (2,563 m), Pale di San Martino (3,192 m) and Monte Pelmo (3169 m) to name but a few, have their rightful place among the most beautiful mountains on Earth. Here are some itineraries to enjoy this unique landscape…. Starting point 1449 m, maximum altitude reached and arrival 2080 m.. Evocative itinerary across the “Val Ombretta”, one of the most beautiful valleys to be found in the area of the Marmolada group, with a breathtaking view on to the south west face of the Marmolada. Many traces are evidence of dramatic events during World War I. Follow CAI track sign posted as n.610. Walking time approx. 3 hours on the road, 2-2,30 hours using the shortcut. Starting point 1200 m, highest altitude reached 1456 m, arrival 1222m. Extremely easy itinerary, at the foot of Monte Mignon, among old houses and haylofts typical of a rural period which now belongs to the past. Time to complete walk: 1.30 – 2 hours. Departure at 1,258 m, maximum altitude and arrival at 1,449m. One of the most classic itineraries from Rocca Pietore, through a deep gorge of great and charming beauty. Traveling time: 1 hour. If you’ve tried it, you know: what you feel on a mountain bike is unique. Breathe in mountain air, feel part of nature, using an ecological means of transport. Easy 2 km path along the Pettorina stream. SOTTOGUDA – SORARU’ – CAPRILE – MASARE’ 30 km medium difficulty path. This runs along the Pettorina stream down to Caprile to then carry on towards Masarè along the River Cordevole. Departure and arrival : Malga Ciapela. Along the Pettorina Valley, Passo Fedaia, Val di Fassa, Passo San Pellegrino. A trip that is interesting both for the nature and scenery. It covers about 90 km on tarmac road, cycling paths and tracks. Demanding. Punta Rocca – Sass de le Undesc – Passo Fedaia – Capanna Bill 18.700 km, 1,500 metre neg. difference in level Demanding. Compulsory assistance of an alpine guide. Only by booking. The path starts on the glacier, the second stretch through scree and rocks until you reach Fedaia lake, to end on green mountain meadows. It is definitely an original descent, where generations of mountaineers showed courage and heroism that went down in the history of climbing and where also soldiers tragically fought during the Great War. Mentioned in the “TUTTO MOUNTAIN-BIKE” magazine. Rifugio Padon – Plaz Ciampei – Plan de Pescoi – Arabba – Porta Vescovo – Col dei More – Passo Fedaia – Malga Ciapela 32.900 km, 1,797 metre neg. difference in level, 205 metre pos. difference in level It offers excitement and breathtaking views one after the other. Very technical, some stretches though are just relaxing cycling. This route alternates between hard stretches and parts of medium difficulty. Mentioned in the “TUTTO MOUNTAIN-BIKE” magazine. Welcome to the wonderful mountains to motorcycle lovers who will experience the thrill of driving along well-outlined roads that wind along woods, crags and mountain passes. Welcome to our home where you will find a covered parking for motorcycles, with washing service. A good trip and a pleasant stay for all our guests after a day spent on motorcycles and a relaxing Turkish bath, sauna or hydro-massage ready to be right back on the Dolomites roads. I wish everybody to have good fun, reminding of being responsible and prudent when traveling these streets, as beautiful as challenging. Abbiamo trascorso un soggiorno indimenticabile presso l’Hotel Camoscio, situato in una posizione strategica per chi vuole la massima tranquillità ed allo stesso tempo l’accessibilità ai luoghi di maggiore interesse della Marmolada…. From south : Venice, take the motorway A27, from Mestre to Belluno, and then the state road SS 203 through Agordo to Cencenighe. From here follow the signs for the Marmolada, through Caprile, and you can reach Rocca Pietore in a bit more than an hour. From North north-West : Leave the motorway A22 towards the Brenner Pass at the Ora exit, take the SS 48 along the valleys of Fiemme and Fassa to Canazei, where you go over the Passo Fedaia to get to Malga Ciapela and so to Rocca Pietore. In the month of April only half-board is paid. Ask a quote for your Holiday! Offer “Skiing in Marmolada in the spring sunshine! 7 days stay for the price of 6.